It's the two-year anniversary of this blog. 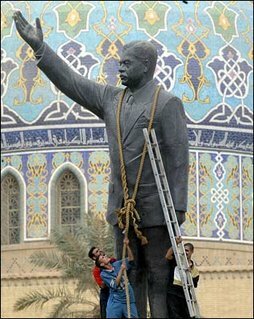 Oh, yeah, and Saddam Hussein was hanged. I know many libertarians who will be celebrating, but I'm not one of them. Don't get me wrong. I'm not shedding any tears and I'm even kind of pleased, but I think that left-wing uber-blogger Idiot Savant is right - not even Saddam deserved the death penalty. Richard Dicker, director of Human Rights Watch, says "The test of a government's commitment to human rights is measured by the way it treats its worst offenders..." (hmm, unfortunate name, that one). H. L. Mencken, early 20th century American writer, said, "The trouble with fighting for human freedom is that one spends most of one's time defending scoundrels. For it is against scoundrels that oppressive laws are first aimed, and oppression must be stopped at the beginning if it is to be stopped at all." No dissent from liberty-minded folk to the words of Mencken. For example, we're always ready to defend the rights of scumbags like holocaust-denier David Irving. But if Irving has a right to free speech, did Saddam really deserve death? If we sanction the execution of genocidal sadists, who's next? exactly - I'm a libertarian, but strongly against the death penalty - even for tyrants. violent force should only ever be used in self defense, or the defense of others or property. Using violence for vengeance does nothing but harm.